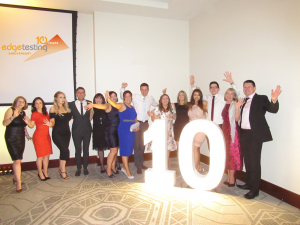 Software testing company Edge Testing Solutions celebrated a decade in business with a cheque presentation at its 10th anniversary celebrations, after completing a £5,000 fundraising initiative for nominated local and national charities, which were invited to attend the event. 10 volunteers across Edge’s offices walked 500 miles from the company’s Glasgow office, via its new Digital Test Hub in Birmingham, to its London premises on a treadmill, in support of the 10 charities, and Edge donated £10 for every 10 miles walked, with the proceeds split between the 10 charities. The chosen charities that Edge donated to were: Acorns Children’s Hospice Trust, Birmingham; British Heart Foundation; Cancer Research UK; NSPCC; MacMillan; St Andrew’s Hospice (where Susan Chadwick, joint founder of Edge, spent her final days); Glasgow Children’s Hospital Charity; Digital Xtra Fund; Brick by Brick; and Little Stars. In addition to the 500 mile run, Edge employees have also been participating in other fundraising activities in support of the 10 charities, including a raffle at the company’s 10th anniversary event.